U.S. economic growth was weak at the end of last year but better than previously thought, according to the government's third and final report on the fourth quarter. Gross domestic product rose at a mere 0.4% annual rate in the quarter -- better than the previous estimate of 0.1% and the initial reading, which showed a 0.1% decline. Among the reasons: Stronger construction activity. Investment in non-residential buildings grew at a 16.7% annual rate, nearly triple the previous growth estimate. Stronger exports also helped raise the overall GDP reading. On the flip side, businesses fearing the fiscal cliff cut back in the fourth quarter, trimming inventories of goods on hand. And the government slashed spending on defense. Together those two factors eliminated nearly 3 percentage points of growth from GDP, and those readings didn't change in the latest report. But the worst economic hit of the fiscal cliff was avoided. And growth appears to be fairly solid so far this year -- thanks to a strong housing recovery, improved hiring by businesses, and a pickup in car sales and consumer spending. 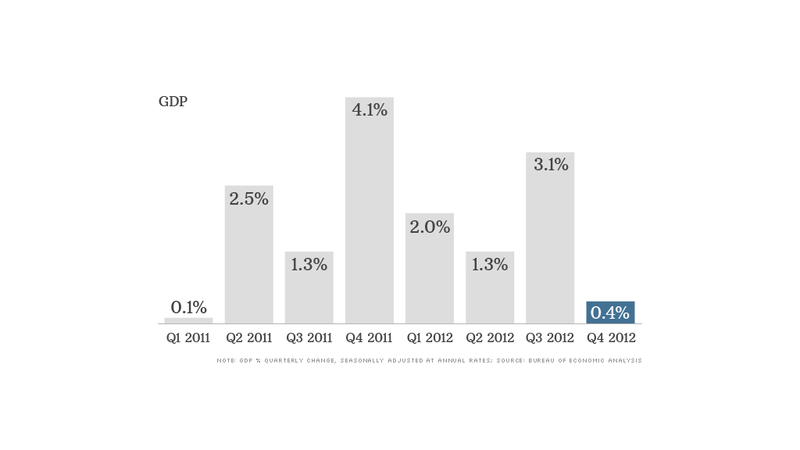 Economists are generally forecasting much stronger growth in the first quarter of 2013. The consensus of experts surveyed by the National Association of Business Economics is for first quarter growth of 2%, while Goldman Sachs recently raised its first quarter forecast to 2.9% growth. But how long stronger growth will continue remains a question. A budget deadlock in Washington led the government to start cutting spending this month. The Congressional Budget Office estimates those cuts, known as the sequester, will trim 0.6 percentage points off growth and cost as many as up 750,000 jobs. Federal Reserve Chairman Ben Bernanke has warned that the cuts will be a "significant" burden to the economy.